UPDATE 05.26.12: The AmericanElect organization is willing to prolong its caucuses pending input from the general public about interest in establishing and preserving a viable ‘third party’ system. Please support these efforts. 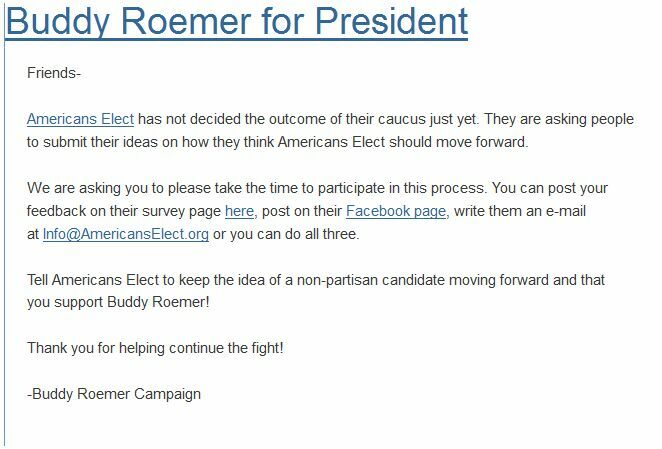 The quickest way to clean up the 2 major political parties; is to pick a President like Governor Buddy Roemer, who isn’t owned by either one of them (or by any of the people who own them). Mr. Roemer currently polls nationally at 7%; if he reaches 10%, he will be included in this fall’s Presidential debates. But first, he has to get on the ballot. And he can only do this by receiving 10,000 votes, by Monday, in the on-line primary run by AmericansElect. 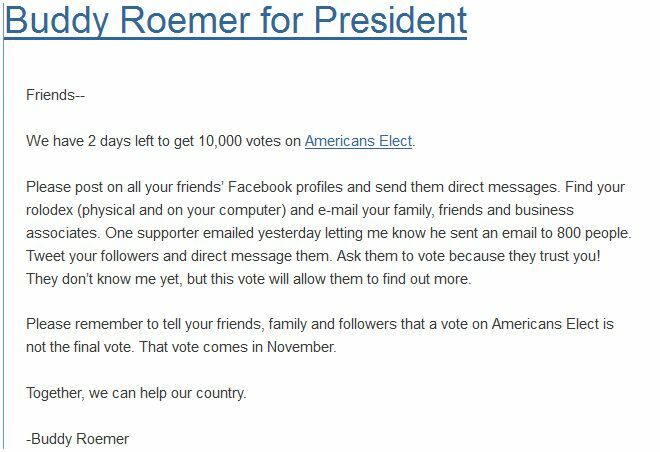 Please, take the time to register to vote on line with AmericansElect to get Buddy Roemer on the ballot. Voting for him now does not mean, you have to vote for him in November. But you just might, after the networks finally let you hear what he has to say. How to Support Buddy on Americans Elect. This entry was posted on Saturday, May 12th, 2012 at 21:00 and is filed under Uncategorized. You can follow any responses to this entry through the RSS 2.0 feed. You can leave a response, or trackback from your own site.